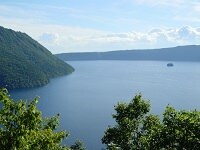 Lake Shikotsu-ko is located in southwestern Hokkaido, west of the city of Chitose. It is a crater lake that was formed over 30,000 years ago by volcanic activity, and it has a maximum depth of 360 meters, making it the second deepest lake in Japan. It is an oligotrophic lake with visibility to a depth of 25 meters, and does not freeze in most winters. 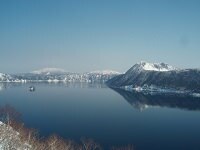 This makes it the most northerly lake in Japan that does not freeze over. 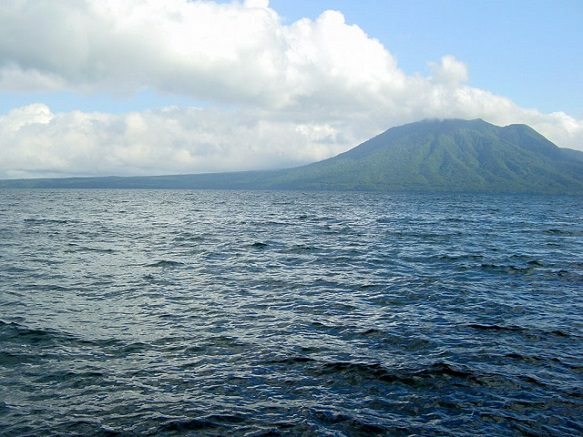 The lake is surrounded by Mount Eniwa, Mount Fuppushi, and Mount Tarumae, and formed when the land enclosed by these volcanoes caved in. 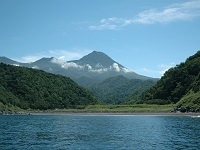 Most of Shikotsuko is little developed except for Shikotsu Kohan, a small, touristy town with a visitor center and a small number of lodgings along the lake's western shores. From there, visitors can rent boats, bicycles or scuba gear to enjoy the natural surroundings. In summer, people enjoy boating on the lake - on pleasure boat tours, cruisers and motorboats, or they fish for rainbow trout or go scuba diving. 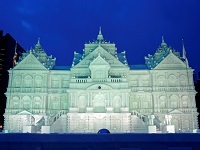 In the winter, the Chitose-Shikotsuko-Hyobaku-matsuri Festival (ice waterfall festival) is a popular festival featuring beautiful sights of objects created from ice. These creations are then lit up, producing a breathtaking production. Koke no Domon, Japanese for "Moss Canyon", is another site of interest in the area. Located ten kilometers south of Shikotsu Kohan, Koke no Domon is a gulley with a rich variety of plant life lining its walls. There are said to be over twenty types of moss alone. Visitors cannot actually enter the gulley, but there is an observation platform from which it can be viewed.